Caldwell was by far the best. The company made truly exquisite lighting and they were the #1 choice for architects across the country. Indeed, when McKim, Mead & White redesigned the White House in 1902 for Theodore Roosevelt, they specified Caldwell fixtures throughout the famous building. 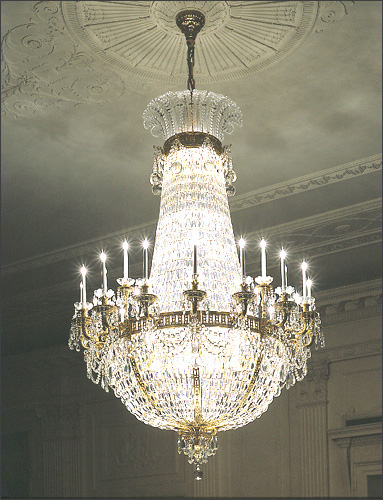 Today, many of these fixtures remain, including the three iconic chandeliers in the East Room. Caldwell closed in 1959, but had stopped producing truly incredibly lighting just before Wold War II. After the war, the company shifted to more standard fixtures and fluorescent lamps. Luckily, the company archive was acquired by the Smithsonian. The famous East Room in 1904, two years after being rebuilt by McKim, Mead & White. 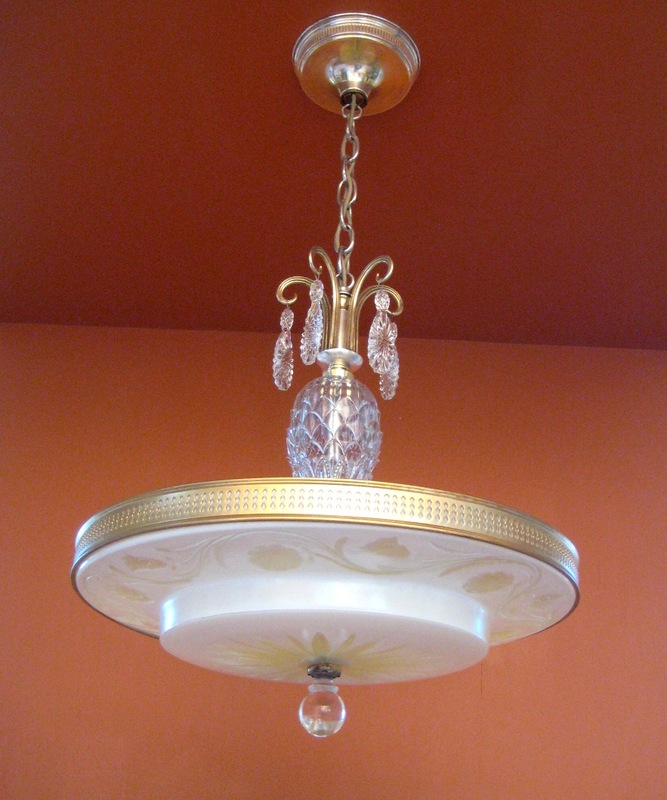 The three chandeliers featured cut-glass by Christoph Palme & Co., Parchen, Bohemia (Austria-Hungary). 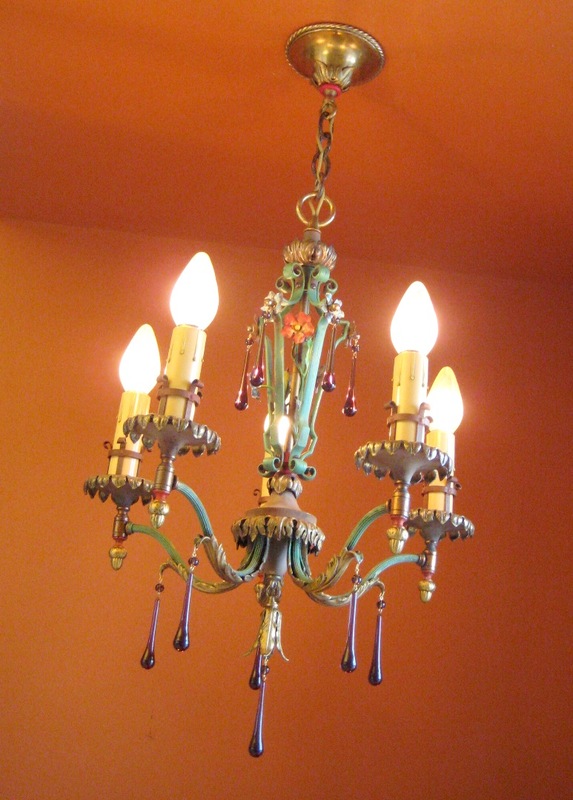 Originally, the chandeliers were longer than they are today. 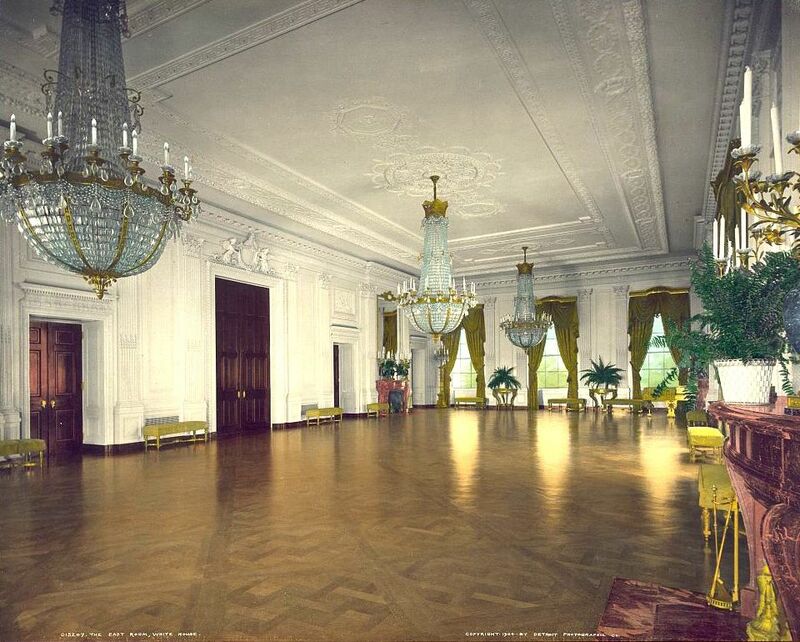 Just a year after being installed, the chandeliers were reduced in height, and again after the Truman reconstruction of the White House. I prefer the longer version. I rarely offer Caldwell fixtures as they are hard to find. 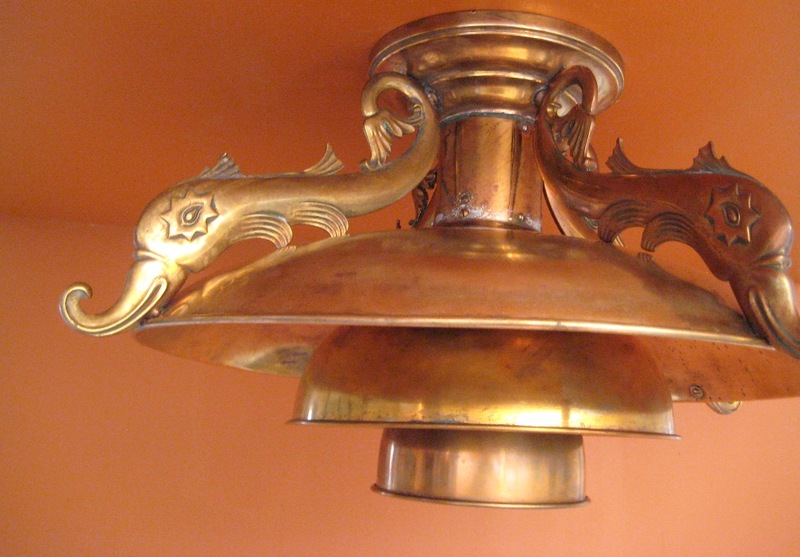 I did once find an extraordinary set of four 1930s fixtures by Caldwell, with stylized dolphins, and reportedly from the indoor pool of a Long island estate. The set sold quickly, and today graces the poolhouse of a home in Key West. 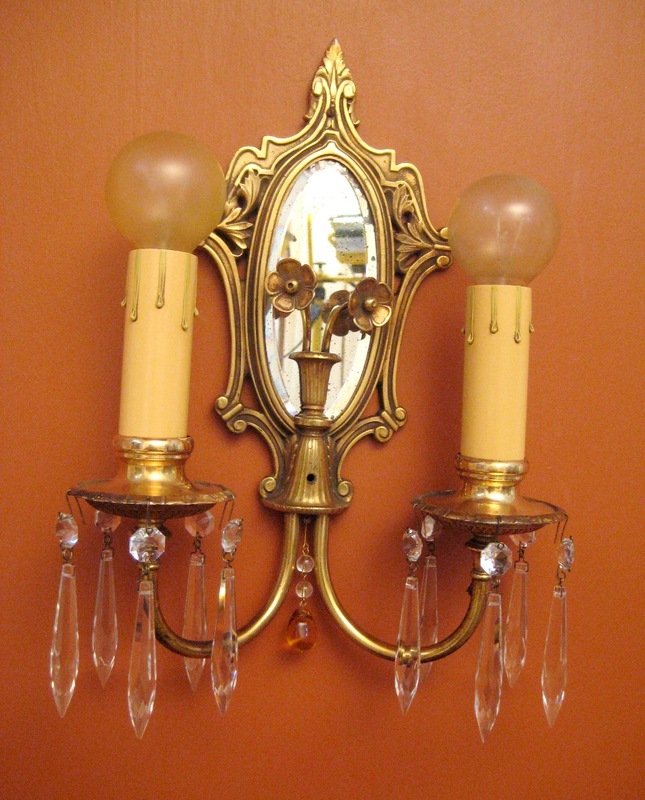 The only other Caldwell fixtures I have ever offered was this pair of lovely, exquisite sconces. No American company produced the kind of quality fixtures for which Caldwell was celebrated. So, a very distant second place would go to Lion Electric. However, even though a distant second, Lion nonetheless created stunning, high-quality lighting. I know nothing about the company, and have only ever offered fixtures by Lion made in the 1920s. Was this the only decade for which Lion Electric operated? I suspect that Lion Electric did not stay in business long as their fixtures were so over-the-top in terms of manufacturing costs. I love Lion, and over the years have acquired numerous fixtures by the company. Some of my favorite-ever fixtures are by Lion. A 1920s chandelier by Lion, and with a Durand glass vase in the center (which lighted up). Another knock-out by Lion Electric. The crystals were new. Another knock-out by Lion Electric. The above three chandeliers were all purchased by Linda, who has several houses rich with amazing fixtures. Even sconces by Lion Electric are incredible. 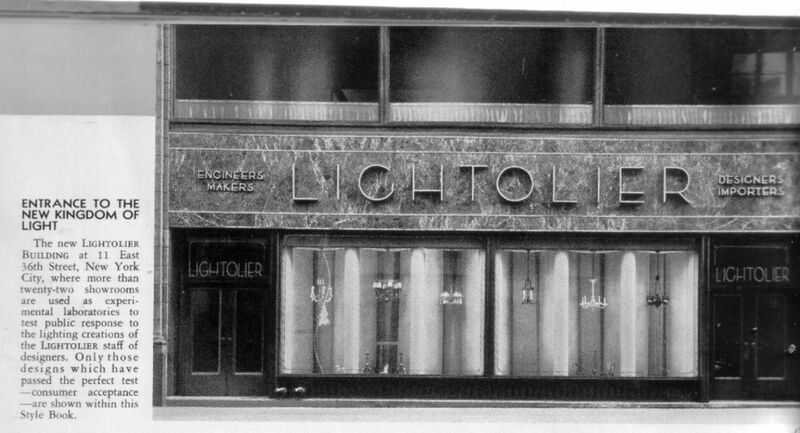 Incredibly, the Lightolier Company is extant today, although they have not made truly distinctive lighting since the mid-1970s. 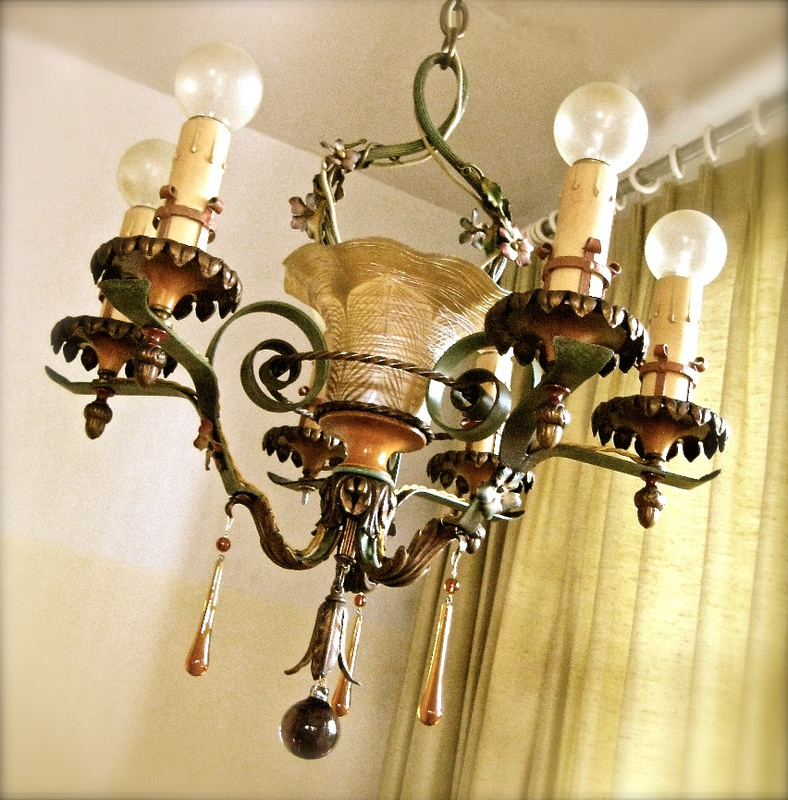 It is a pleasure restoring vintage lighting, particularly Lightolier fixtures as they were so beautifully made. Lightolier was able to do something which Lion Electric apparently could not do: create high-quality lighting, and make money. Starting in the 1920s, Lightolier produced gorgeous, luscious lighting, and during the ensuing decades was in the vanguard of innovation. Lightolier prices were about twice the price of seemingly comparable fixtures by other lighting companies. This premium was for the quality, design, and the Lightolier name. Kinda like the difference between a Chevy and a Rolls-Royce. This premium still applies today. The new Kingdom of Light, no less. What I would not give to time-travel. The building is extant; the showroom is not. 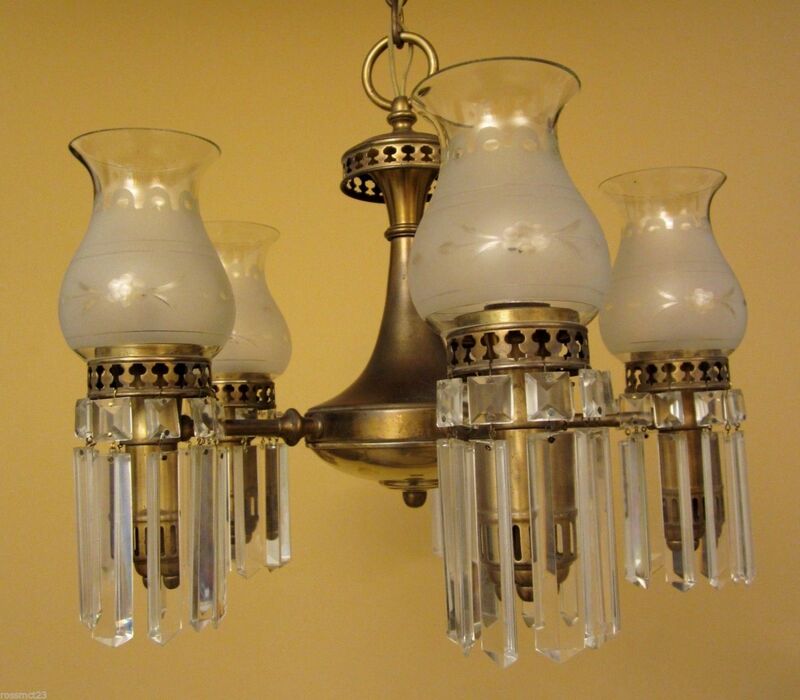 This beauty with stunning cut-glass shades was offered by Lightolier in the 1920s. A remarkable circa-1940 chandelier by Lightolier. I spent many years hoping to find this fixture with ALL its original parts, my personal Holy Grail. And I found one! The shade is even better lighted. 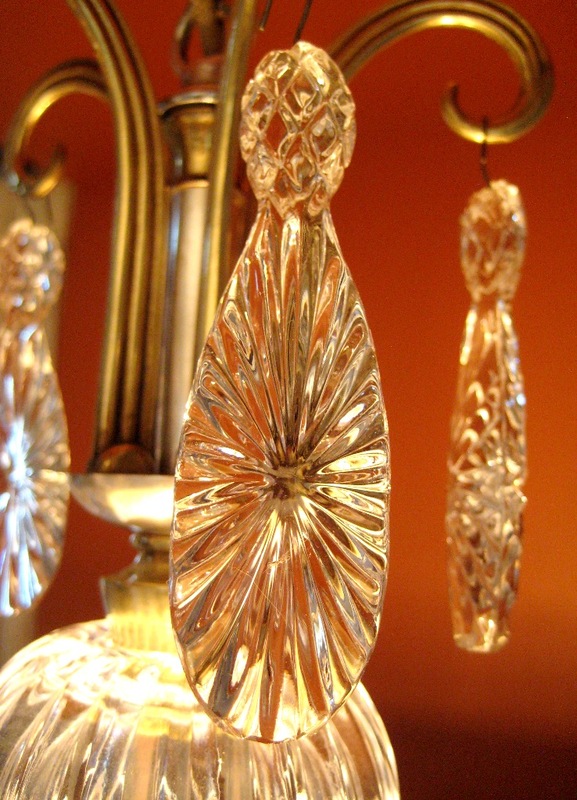 The five crystals were custom made for this particular fixture. Gorgeous. 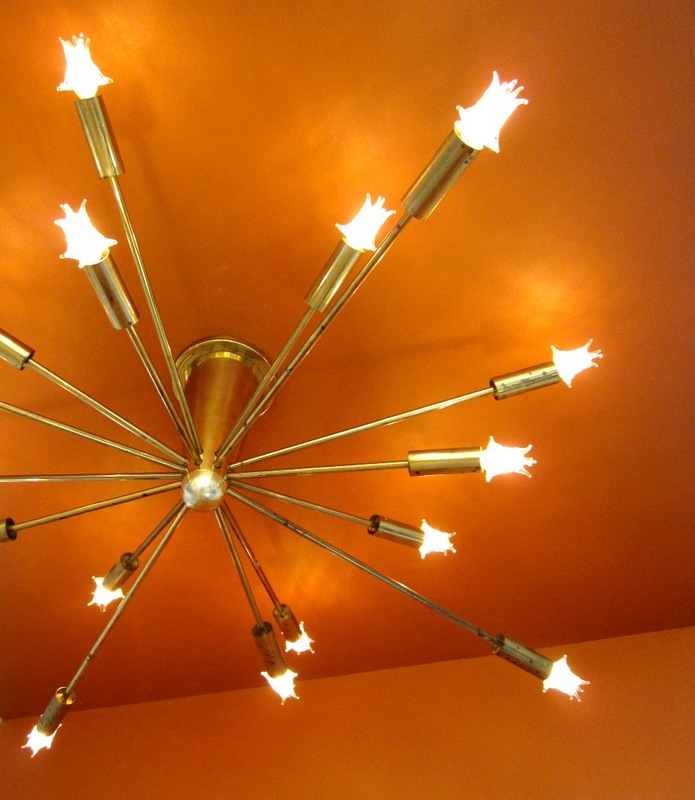 Today, Sputnik fixtures are commonplace. But Lightolier introduced the style in the early 1950s, even before there was a Sputnik satellite. They called the fixture Astral. I was thrilled to offer one (not yet restored in the image). Some of the most remarkable lighting of the 1950s was created by Lightolier. The company continued to create remarkable lighting until about 1975. I love Lightolier so much that I have a special Lightolier category at my online store. 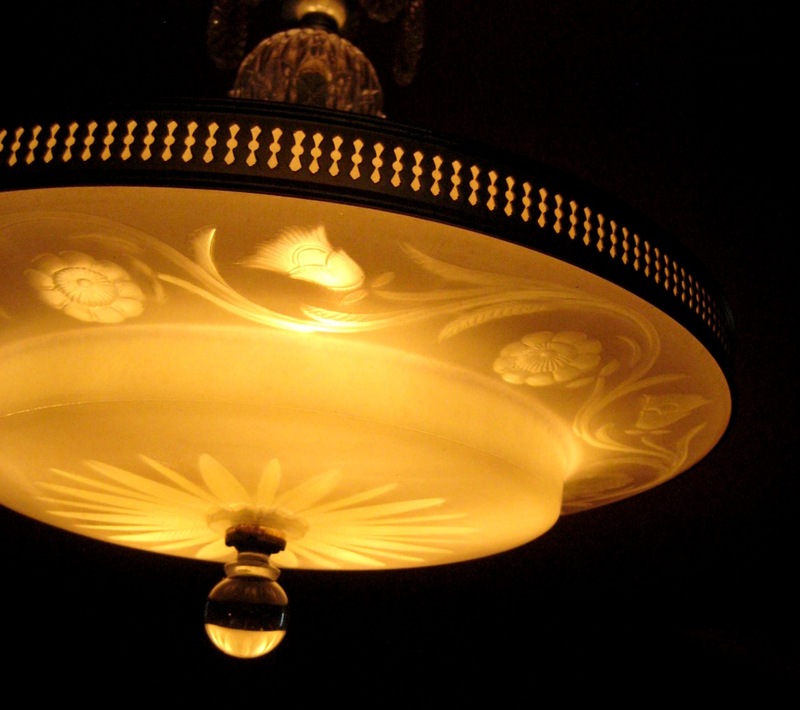 There are other lighting companies I love, such as Gill Glass, which created stunning fixtures, but the three companies above were responsible for the very best lighting in America during the early to mid twentieth-century. Thank you so much for this article. Because they so appealed to me for their design and for the quality of their casting and manufacture, I bought a pair of Lion Manufacturing sconces six or seven years ago in preparation for a Spanish Colonial Revival home I was starting to plan to build. I’ve now been building that house and have ten of the same intricate and thoughtful design, though some are two lights and some are single. They will surround the dominant living room area. They are my favorite sconces of the thirty or so I have from the 20’s. Nearly everything I see by Lion is beautifully executed. These chandeliers you show are just stunning in their bold, yet tasteful, approach. Anyway, I was so pleased to read about Lion’s relative position in the American lighting trade, because their workmanship seems to demand it. Your conclusion that the expense of making their fixtures probably drove them out of business is most interesting and seems sadly logical. This was so interesting & educational. You are truly an expert. I wondered if you would ever reconsider the gas/electric combo original to the Cross House? With some rooms you are choosing electic rather than original decor. Why not a stunning light fixture if it fits the room? Perhaps stick with 1894 lighting in the main entry with the period correct wallpaper? You are the expert as evidenced by your progress!! Good luck with the continued Cross House updates! I am using a mix of lighting in the house. 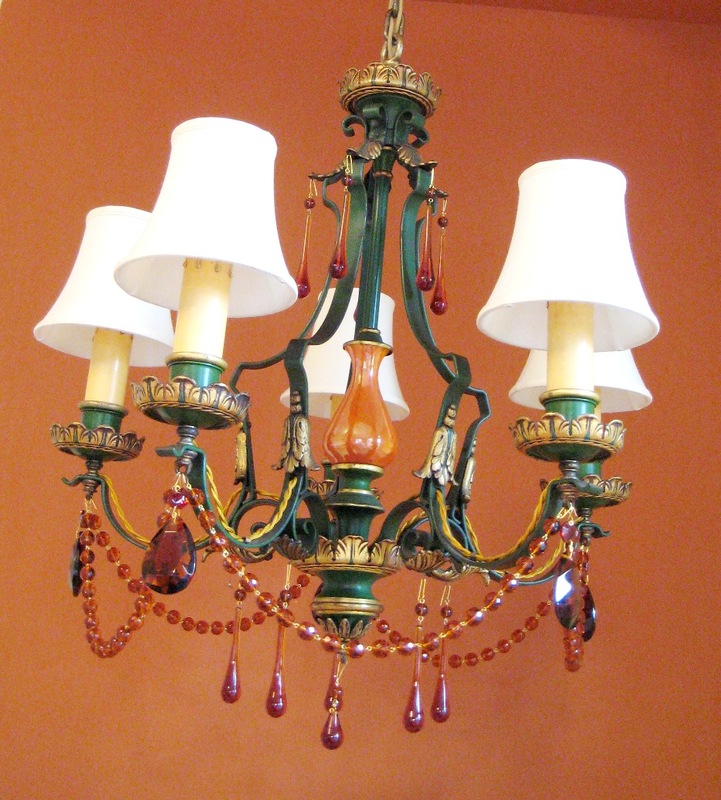 Most rooms will have period-correct gas/electric chandeliers and sconces. But the library has 1970s Hollywood-Regency-style pendants. And my bedroom has a 1960s Hollywood-Regency crystal chandelier. How wonderful! I love your decorating eye! Amazing progress! Way to go Ross! And two floor lamps , and a fireplace mantle candelabra , all matching . I was so glad to read your article . I treasure my collection and realized how rare they were . I was delighted to see my exact chandeliers both matching the first Lion Rlectric picture you shared !